If you’re like me, you love watching “No Reservations” on the Travel Channel with Anthony Bourdain. And if you do watch, you know that Bourdain has a thing for Vietnam, and even more specifically a Vietnamese noodle soup called pho (pronounced fuh, like duh with an f). Every time he’s anywhere in Vietnam you get treated to watching him and his cohorts slurping down this soup while an elaborate voice over explains why this is the soup to end all soups (I suspect the voice overs are because he doesn’t want to stop eating to discuss.). Now many of my readers live in large cities and I suspect getting yourself a bowl of pho isn’t too rough if there’s any kind of Vietnamese population where you live. With a little research I found two places about 30 minutes from where I live that serve pho, so I picked the one that had good reviews for its pho and was located somewhere I felt confident I could find. So, at the end of May, for my birthday, my husband took me there for lunch so I could finally try pho. For those of you who are unfamiliar with pho, let me break it down for you, at least in respect to what I had. It’s a very complex broth soup, in the case of what I had, beef broth, that has rice noodles, a variety of onions (yes, there was heart burn, exquisite, delicious heart burn), and since I ordered the pho bo, which is pho with thinly sliced beef, there was a load of thin slices of beef in there. 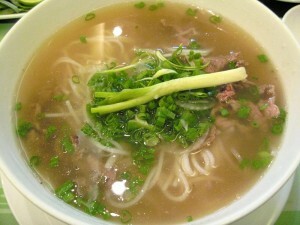 On the side you’re given a variety of things to add to customize the pho to your tastes. I got a plate with fresh bean sprouts, lime, hot peppers and basil, and a small dish that had a spicy chili sauce and I think fish sauce. Never having had pho before, I first had a few tastes of it without adding anything. It was a yummy soup that tasted exotic and yet oddly familiar. Vietnam meets childhood broth soup. After a few tastes I decided the lime would be good in it and squeezed the wedge into the bowl. Also, since I like bean sprouts I put a bunch of those in right away. Not being able to handle overly spicy food I opted to skip the fresh hot peppers and I didn’t love the idea of fresh basil in the broth so I skipped on that. Since basil is a staple, I’m sure it tastes fine; it just didn’t seem to click for me. I enjoyed the pho like that for a while and then decided it was time to try out the sauces. I tasted both sauces, and the chili sauce was very spicy. I put in a healthy dollop of the fish sauce and a tiny touch of the chili sauce. For me, this is when the soup went from good to awesome. Ironically, my husband doesn’t care for fish sauce, so for him it went from awesome to okay. And that’s how I enjoyed my pho bo. I thoroughly enjoyed it, but at the same time I couldn’t work up the near fanatical adoration for it that Bourdain possesses. I ate half the bowl and took the other half home. End of story? Guess again. Once I was home, I kept thinking about the pho bo in my refrigerator. I thought about it so much that despite having a filling dinner I found myself heating up a small bowl of it for a snack later that night. And once it was gone, that’s when it began. I would find pho sneaking into my mind a lot. I found myself looking at the calendar, trying to figure out when I could get down to that restaurant again for more. And that’s when I realized what Bourdain was talking about, pho gets inside you, and I’m not just talking about in your belly when you eat it. It’s combination of home-cooked noodle soup memories from your childhood laced with exotic flavors from another land…it’s a heady mix indeed. So yes Bourdain, now I get it. Post Script: I recently got to go back for more pho. This time I had pho tom, which has shrimp instead of beef. Delicious!